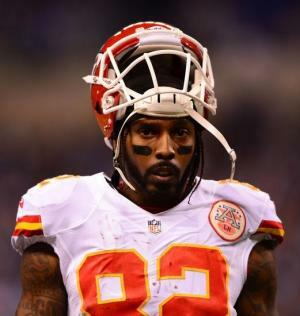 Dwayne Lorenzo Bowe, born on the 21st of September 1984, is a professional American Football player, who became known for playing as the wide receiver of Kansas City Chiefs in the National Football League (NFL). So how much is Bowe’s net worth? As of mid-2017, based on authoritative sources it is reported to be $25 million, acquired from his years playing professional American Football in the NFL, which began in 2007. Born in Miami, Florida, Bowe was initially raised in a single parent home. He is and his brother were taken care of by their mother, but soon their paternal grandparents took over. His rough childhood led him to become a troublemaker at school. After being badly injured into a nightclub fight during his junior year, it was then that he joined his high school’s American Football team. Despite joining late, his performance with the Miami Norland High School football team earned him an athletic scholarship with Louisiana State University. In 2003, Bowe officially joined LSU’s football team, and became the Tiger’s wide receiver. Even as a freshman, he already appeared in 13 games and became a backup for the team’s BCS national championship team. During his sophomore year when the Tiger’s wide receivers left, Bowe took center stage, and was poised to become a starter for his team. He helped the team win numerous games, and in his final year in LSU, he set the record with 12 touchdown catches for the year. In 2007, Bowe decided to become a professional football player and joined the NFL Draft, being selected 23rd overall by the Kansas City Chiefs, and was joined by his former teammates Buster Davis and JaMarcus Russell. His entry into the NFL started his professional career and also his net worth. Bowe played with the Chiefs for a total of eight years. During that time, he set plenty of records, including for most consecutive games with a touchdown – seven – the most touchdowns in a single season in 2010, totalling 15. He was also named to his first Pro Bowl in 2011 and became one of the highest paid receivers in the league. In 2014, Bowe was suspended after he was arrested from previous year due to possession of a controlled substance. The following year, the Chiefs released him after playing with the team for eight seasons. His time with the Chiefs helped his career and tremendously increased his wealth. In 2015, Bowe signed a contract with the Cleveland Browns, but was released after one year. In terms of his personal life, Bowe is apparently still single.